If guest blogging is a recurring component in your brand’s content strategy, you’ve likely noticed that the metrics just aren’t as strong as they used to be. In fact, if you’ve been pursuing guest blogging long enough, you’ve probably observed those numbers slowly dying off until they’re practically zero. Don’t worry. You aren’t losing your touch or approaching guest blogging the wrong way. Instead, this strategy is naturally becoming less effective as other strategies gain prominence. 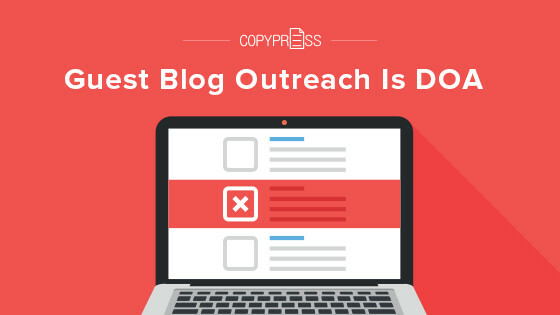 Find out why guest blog outreach is dead and discover alternative solutions to get your content seen. Years ago, when the concept of blogging was first gaining steam, guest blogging presented a viable option for many brands. 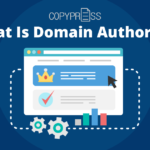 After making a connection with the owner of a high-ranking site, ambitious brands could earn the opportunity to publish a guest blog post with backlinks, thereby tapping into an expanded audience, gaining extra traffic, and getting new subscribers. As the idea of guest blogging became more popular, however, the nature of these posts started to change. Rather than offering value to readers, many guest blog posts began to read as low-quality content or even spam. Since low-quality content can affect even a prominent site’s search engine rankings and turn away regular readers, many publishers stopped accepting guest blog posts. Over the years, the content marketing landscape has also changed substantially. Most internet users follow much more than one blog, and many consume large amounts of content from a wide variety of sources. 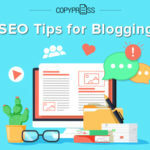 As they face a combination of increasingly limited attention spans and more content than ever competing for their eyes, most readers will simply skip over an irrelevant or low-value guest blog post. As this BloggerJet study shows, referral traffic from guest blog posts has become abysmal, making this strategy ineffective for both publishers and brands seeking exposure. Guest blogging may be on the way out, but your brand still has plenty of opportunities to expand awareness and attract your target audience. One of the most effective ways to grow your audience is to create eye-catching content. 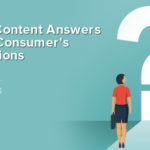 Bite-size blog posts, long-form articles, and other types of text-based content still have their place. When you really want to get attention, however, consider branching out with new types of digital media. Whether you want to create interactive infographics, produce videos, or make animations, you’ll find new ways to tell your brand’s story and engage your target audience. You can’t argue with the impressive metrics that digital media generates either. An estimated 79 percent of internet traffic comes from video, making this type of content the most loved among virtually any audience. Since infographics make up the most popular type of content to share, creating a high-quality infographic that’s relevant to your brand could easily amplify your social media presence. Creating and sharing the right kind of content is essential to improving your social media presence, but you can also do much more to boost your brand. First, rethink your social media content strategy. The links you’re sharing might be gold, but you’ll need to compel your audience to click through to read your latest blog post or access your newest infographic. Make a point of sharing snippets of your infographics or eye-catching images from text-based content to pique interest, and be sure to include calls to action (CTAs) so your audience knows what to do. Next, give your social followers ample opportunities to consume your best content. 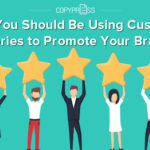 Try creating attention-getting cover images for Facebook or Twitter to promote your latest infographic or ebook. Link to your newest piece of high-value content in your Instagram profile to increase click-throughs. Don’t stop after a single share. Use a social media management platform like Buffer to schedule content shares and reshares automatically. Since you can monitor performance with Buffer’s tools, you can easily see what’s working and fix what isn’t. Just because guest blogging is dead doesn’t mean you can’t connect with high-ranking site owners or experts in your industry. Instead of asking them for a guest blogging spot, however, build a relationship by offering value. Ask experts for their take on hot topics and feature their responses in your next in-depth article or case study. When you publish your content, be sure to link back to their sites and tag them when you share on social. You could earn an audience-boosting share or a content-amplifying retweet. If your content offers enough value, you could even earn a backlink from a major figure in your industry. You already know that spammy guest posts and low-quality writing can harm your site and turn away readers. Rather than churning out as many short and sweet blog posts as possible in an attempt to create more content, try growing your brand by producing higher-quality content instead. 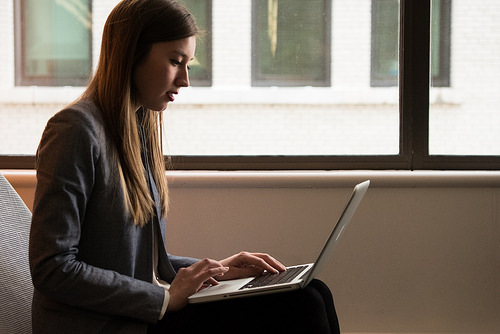 Think your most recent blog series is some of the best content you’ve ever produced? Give it the attention it deserves by turning the posts into an eBook that provides unique value to your audience. Then promote it on your social channels and offer it as a content upgrade that generates leads. If you never touch your content again after publishing, it’s time to rethink your strategy. 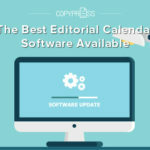 In many cases, adding select updates can give great content new life and add even more value to your top-performing content. If your brand’s best-performing ultimate post already ranks for keywords, try adding a relevant link to a great resource on an important industry site. You could get a link back or a social share that boosts your credibility. Finally, review the most popular blog posts on your site. Identify relevant places to add branded CTAs, internal links, and content upgrades to get even more eyes on your top-performing and highest-value content. Don’t let the death of guest blogging get you down. Follow these tips to improve content visibility and make sure your brand gets the attention it deserves.